Originally released in 1996 by Capcom, the game was re-released on the GBA in 2003. Puzzle Fighter is often hailed as the best puzzle game of all time, Super Puzzle Fighter II Turbo is chock full of ferocious competition, pint-sized characters and non-stop high-energy insanity. Carefully stack the falling colored gems in strategic combinations and when the moment is right, use a crash gem to shatter your blocks. Watch your character execute a combo move and rain a volley of counter gems down on your opponent! Be the first to fill the other's screen with gems and KO! You win! Timing note: The time is calculated by adding up the clear times of each fight. The total time posted at the end of each fight is too inaccurate to use. Best time as Ryu: normal difficulty 0:04:40 by Jeremy 'DK28' Doll on 2010-01-28. Best time as Akuma: normal difficulty 0:06:10 by Jeremy 'DK28' Doll on 2010-01-28. Best time on X'-Mode as Chun-Li: Expert difficulty 0:04:21 by 'bluebomber285' on 2014-09-02. Best time on X'-Mode as Devilot: Expert difficulty 0:05:37 by 'bluebomber285' on 2015-03-09. Best time on X'-Mode as Dan: Expert difficulty 0:04:37 by 'bluebomber285' on 2015-01-23. Normal difficulty as Ryu 0:04:40 by Jeremy Doll. Puzzle Fighter is another game I've wanted to run for a long time. Just had to wait until I acquired a Game Boy Player. 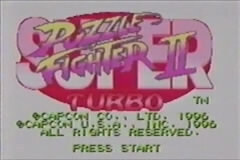 Super Puzzle Fighter II Turbo, while having one of the longest game titles in recent memory, is my favorite puzzle game. Ever since my first time playing it in Las Vegas, I was hooked. So let's get on with it already. The strategy for any of the normal characters is to build up any reasonable sized block combo and smash your opponent as quickly as possible. The regulars dish out enough damage that a few six and four blocks will get the KO before the computer can retaliate. The luck factor in any run is guessing the right color to build each round and commit. By the time you figure out if you're wrong, it's too late, when you're playing for speed. Ken - I start with red, which works out to over six blocks big and finish him off with the green. Pretty straightforward, the lag with the first opponent is that they let the block fall at normal speed, so you have to wait longer for the counter gems to fall. Donovan - Green FTW. The results speak for themselves. Super finish. Chun-li - I mess up one block while building the blue, but no time lost given the counter block count. The preceding green/yellow crash set up the blue finish perfectly. Morrigan - I was able to build a nice red attack, but then I had to nickel and dime the succubus to death. Glad I had that yellow four block ready. Evil Ryu - I thought I picked the wrong color at first, but I was able to build into a nice blue/red combo. I then immediately followed with a big yellow block to grab the W.
Hsien-ko - The game gave me a freebie to start a red block, I build the yellow as a back up. I almost second-guessed breaking the red that early, but good thing I did as the game was stingy and refused to cough up the yellow crash gem. So I use the diamond on the yellow to win by exact count. And, yes, I do keep count of how many blocks I need to drop to win. Simple multiplication people. Sakura - Interesting round here. I just couldn't get a big block going. However, I was able to relentlessly attack the poor girl into submission. This shows as I pummel her to death with an almost clear playing field for the duration of the round. Felicia - A really great round. A free red to start building and I get the nine high yellow for the big blast. Round over. Always nice to have the final round go well before Akuma. Akuma - The difficulty always seems to bump up a few notches here. I stave off any attack and build a monster red to finish the run. Normal difficulty as Akuma 0:06:10 by Jeremy Doll. There have been a few differences in Akuma throughout the home iterations of Puzzle Fighter. For the GBA, the difference is that Akuma actually drops less counter blocks than the other characters, except for his counterpart Devilot. This means that while running, I incorporate a lot more combo attacks, even if it means the first step in the combo is only one block before crashing a big stone. Watch and see. Felicia - Perfect. No pun intended. I end with the "all clear" signaling that I played every block right. Chun-li - Another great round. Diamond yellow, combo into the green, then the blue sends Akuma into the Raging Demon. Very satisfying. Donovan - Red, blood red. I bide my time to combo that big red block of death. It fills donovan's screen just right to land the KO, but without the extended Super Finish animation. Ryu - I build the big green, which I crash and immediately follow up with the small blue. I finish Ryu off and then end with another perfect, all clear. Morrigan - Green is just Akuma's color of choice right now. I know you were waiting for that yellow, but you can see by how the counter gems land on Morrigan, I timed it just right with the first few single block crashes, to fill her screen with no room left. Sakura - Nineteen block red. Raging Demon! Unprecedented, third "all clear" in one run. Tell me that wasn't a thing of beauty. Hsien-ko - I can hear you screaming why I didn't crash that red. You'll see. Akuma just doesn't drop a lot of blocks. I still combo the yellow, and crash the red with a lot more than I originally had and it still barely covered Hsien-ko's screen. Just trust me, I got this. Ken - Huge red, super green combo'ed off the blue. Finish him with the yellow. Wouldn't have it any other way. Using all four colors to gain victory. Dan Akuma - Very methodical this round. I build block after block and don't let up the assault. I defeat the computer and I wasn't even finished. My next piece had a red crash gem to really end it, but the game threw in the towel. Normal difficulty as Dan 0:04:57 by Jeremy Doll. The main difference in running Dan is that you have to ensure you've built up a large enough attack before beginning your assault. Leaving your opponent standing can give them the gift of an entirely red screen to annihilate you with. Pretty Boy Masters - Perfect start. My initial bludgeoning fills Ken's entire screen. Done. Ghoul Hunter - Huge red, then small crashes to finish Donovan off. I only risk this strategy on the first couple of opponents before the computer starts getting "smarter". Strongest Woman in the World - Basic stuff here. Smooth building as I unleash wave after wave of attack. Winged Whore - Sensational round. I build the green blocks up to Heaven and bring it down on Morrigan's head. I diamond crash the yellow for the KO. True Master - Things start off a little slow, but things immediately fall into place as I use the diamond on the green. The red goes next. I'm almost too late as the red in Ryu's field materialize, but my last blue attack seals the deal. She-en-kow? - Red. Need I say more? And I lucked out with the timing. The blocks fall, but Dan doesn't animate his Super Finish with the sun burst background, saving me a few seconds. Wannabe - I'm piece dropping in the beginning, which I hate to do with Dan. But I nail a big blue and finish Sakura off before anything bad happens. Catwoman - I wait on the blue to try and combo it from the red block. I call an audible when I see the diamond, as my count from the regular blue crash and yellow diamond crash would be enough to kill the round. Demon - A dangerous round for Dan. Akuma can be merciless, especially when you're giving him nothing but red to counter. I play perfectly as I build multiple small blocks and get the right crash gems to consecutively attack and bring the pain. KO. Can anybody out there tell me what the heck Dan is saying during all this? Expert difficulty on X'-Mode as Chun-Li: 0:04:21 by 'bluebomber285'. This puzzle based fighting game is a mix of tetris and puyo puyo (or ether mean bean machine or avalanche). The object is to fill your opponent's Matrix until their 4th column is filled, which each character has an Attack Pattern. Some characters have better patterns than others. Out of the four ports this game has, this one did some balancing out to make other character's get some love, and change the all powerful Diamond piece a "Slight" buff. Character Choice: I pick Chun-Li for one simple fact: Damage output. The re-balance rules makes her deal 120% damage. the Drawback for this attack power: A weak attack Pattern. the 2x2 block pattern is easily considered one of the worst patterns out there. Computers: The characters used for each stage will change with each run, but each character has their own "Build" that they stick to. But one thing every computer believes in is: "Keep the 4th column clear." A computer won't take a break if it means adding one gem place to their 4th column. With that out of the way, now we can start talking about the stages. Stage one: Felicia the Cat. Seeing the blue, I build that to a 2x5 with a 2x2 yellow. Break the blue first, followed with the yellow. I believe Felicia only dropped 2 pieces total. Stage Two: Chun-Li, Kick Master. Chun-Li early on means I don't have to worry about counters to my attacks. My build here starts with "Pattern Building" then evolves to "Chain Build" Having a 2x4 red and green means a high 20's attack, and the blue. that's just overkill. Stage Three: Donovan and the Unhappy Anita. I got a 2x3 blue quickly, and even a 2x2 yellow. Also after breaking the blue, a 2x3 red formed. the only Soft drop in the run is to help break the red, to bury Donovan to his 4th only, where he had nothing to break out with. Stage Four: Ryu, Chi Master. I built the yellow in the center and green and red to the left. I tried to keep the red connected, but that didn't work out well. At least i got a 3 chain from the Diamond break. Intermission: Dan getting Hurt is always funny. Yellow on the 1-2 was a good idea, until I attacked early, I got a little greedy, and continued the green. Slow drop from Morrigan at the end was a small killer. Really early with the green, and I had a decent red to follow up, But I botched it, and broke small instead of big. Blue on the left, green on the right. The Build here was perfect. a 2x2 blue, and 2x3 of green, red, and yellow. Break to kick her face. Lots of red from the game to build a 2x6 red. Also got a 2x2 yellow and 2x2 blue, and chained into the red. Ken had no chance to even attack. Final Stage: Akuma "Puzzle Master"
Yellow in the center built to a 2x4, then broke it to prevent him from attacking. Got a 2x2 red to attack as well, then I ran out of power. Diamond helped, but only a small bit. His lucky small breaks helped stay alive for an extra 3 seconds. Overall. I feel that this run is really great. Builds and Chains seem to fall into place quite well. Pattern Building didn't always work, but it doesn't mean that I can't avoid that altogether. Expert difficulty on X'-Mode as Devilot: 0:05:37 by 'bluebomber285'. Devilot is the secret hidden character that you never see. She will only appear on stage 7 when you meet certain criteria. That we won't talk about, but let's talk about her instead. Devilot is a handicapped character. She is the only one to have a base attack of 85%. The trade-off is a great diagonal pattern. This pattern is the 2nd hardest pattern to counter. So to max out my damage, I tend to do chains, mainly in twos and threes, and big double breaks. Diamond can only help so much here, and sometimes causes more harm that help. Let's get to the breakdown. Yellow with a 2x3, blue with a 2x4. Got a small 2 chain with a red into a green. Then a Diamond break into a 2 chain double break, followed with a double break with a small yellow and the 2x4 blue. We have learned from stage 1. Lots of power gems here. Two yellow, one red, and one green. The chain from the red to green helped. Playing the diamond on the yellow was a good call, since we got no more yellow breakers. Get a small 2 chain to lock her in. Red was strong here, and the green was a nice 2nd back-up. Leading the Diamond break on yellow to chain it to blue/green, then chain again into red. High damage output. She attacks first and throw some dinks into my build, but I still got my power gems. The chains were there, and did get the damage in, but it wasn't enough to lock her up high. Left with scrap, I struggled to get a killing blow. Red and Blue, what more could I need? Some double breaks, and Ryu was locked up tight. This one had lots of gems in all colors, I had trouble keeping them all touching. Some good double breaks, and chains, but not seeing the 2 chain quickly in the center cost me a lot of time. And I had some fears at the next stage. The game felt bad for me I'm guessing. a 2x5 in blue, and a 2x7 in red. Those don't even need a chain to have high damage, even with using the diamond on the 2x5. Green is the winning color here. 2x6 tower of power in the center. Let's not forget about the two 2x2s in red and blue. Chain into the green after the diamond, then I break the red, followed by blue. Mixed with the early attacks, Akuma was left with no counters. The lowered damage out from Devilot makes this a challenge. Chains are rare to see in other runs, while this one uses them the most. A challenge I'm sure I'll rise to again. Expert difficulty on X'-Mode as Dan: 0:04:37 by 'bluebomber285'. Dan is just a glass canon. Sending nothing but red. Things can get really ugly if they diamond your attack, or get a breaker. it's a challenge, but if anyone can win. It's Dan. Green here, built to a 3x4 on the break. No chance for her to counter. Red in center, Green to the right. Both were a 2x3 with a double breaker for each color, But did not take it after seeing early red breakers. Diamond on yellow to chain to green, then red and blue follow ups. Early all was there, but not gonna chance that to backfire. Which helped me out with the red 2x3 Ken built for me. A 3 chain involving a 2x2 blue hits half way, then a diamond red to yellow to end it. This stage couldn't be better with RNG. Yellow for days with green and red, and no breakers for Chun-Li. This one started slightly well, then a mis place on the green. Failing to make my block, chain build. Diamond to chain, and it was close. One more tick for Felicia and I was a goner. Blue in the center, everything else is neatly placed junk. Blue break with a diamond follow, then the double break to end it. Green, red, and blue. Another big block being the 3x3 green. And a second close call to death. For the record: 33 seconds. Early red break to tease him with. I build the yellow up to a 2x5 before breaking it. Diamond the blue to form red and green blocks with the 3 chain. Super Rollout attack! He may be a glass cannon, But remember: He'll make you cry like he did, when his Daddy died.